Members of the INS receive exclusive discounts on books, events and subscriptions, as well as unique opportunities to network and collaborate with neuroethics experts and peers. These benefits are available to all member types, including student, trainee/post doc, regular and affiliate members. Apply today to become a member of the INS! Reasons to join the INS! We are pleased to announce exciting new rewards for our members. Whether you are about to join or if you have been a member for some time, the INS is offering you fantastic new opportunities for the same price. And all of our existing member benefits still apply too! Book Discounts – INS members are eligible for a 20–30% discount on a wide range of neuroethics books published by Oxford University Press, Cambridge University Press, Springer and Elsevier. Members can access the available discount codes with their website login. 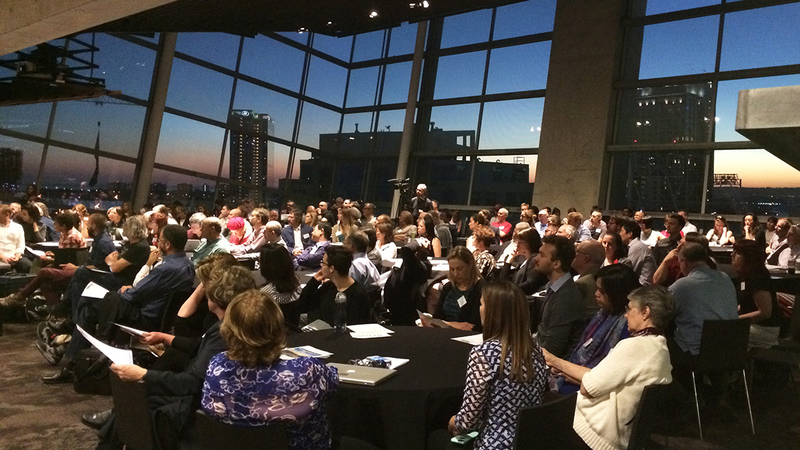 Audience gathered at the San Diego Central Public Library for a public program held as part of the 2016 INS Annual Meeting. Meeting Support – The INS supports members organizing local and regional meetings, talks or seminars on neuroethics. Apply to receive up to $500 in support of your neuroethics event. Joint Membership Discounts – We have teamed up with the British Neuroscience Association to offer a 10% membership discount. Whether a new or long-time member, maintaining both memberships saves you 10% off the cost of each organization's annual dues. Advice and Mentoring – Do you need guidance pursuing a career in neuroethics? Our experts provide advice on career tracks, funding sources and research to fellow members as part of group and 1-on-1 activities. Group Membership Discounts – We offer discounts for institutions, universities and non-profit organizations whose faculty and staff are interested in joining the INS. Save 10-25% compared to the cost of individual memberships. The INS is now also a member of the International Brain Research Organization and the Federation of European Neuroscience Societies, making connections with thousands of neuroscientists all over the world. Don’t delay, join the INS today! Current members may complete the membership renewal form.